Nathan Followill's artist page for Zildjian lists the Zildjian 24" K Light Ride as part of his setup. Jerry Johnson, Rob’s studio drum tech for the past four Linkin Park albums, describes the kit pictured here as the main recording rig for the session and provides us with its details. Joey is an [official Zildjian artist](http://zildjian.com/Artists/C/Joey-Castillo). 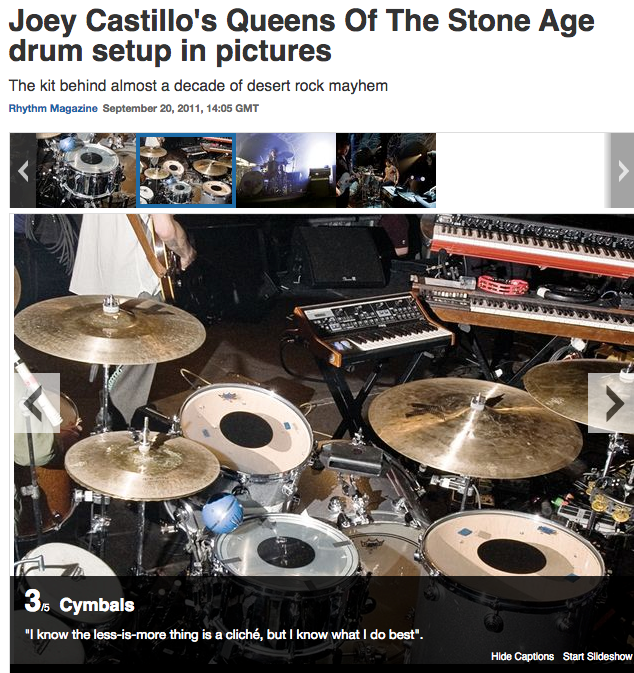 According to this [article from *Music Radar*](http://www.musicradar.com/news/drums/joey-castillos-queens-of-the-stone-age-drum-setup-in-pictures-499402/4), Joey uses the 24" K Light Rides. Joey says "I know the less-is-more thing is a cliche', but I know what I do best." In this Facebook post from *Zildjian Company*, the 24" K is listed in caption of photo, also ride cymbal in shot is clearly a Zildjian K.
In this interview on DRUM! Magazine, Atom Willard tells about his career as a drummer and in the end there's a explanation of his drum setup on Against Me! Tucker Rule endorses Zildjian Cymbals, and according to his [artist profile](http://zildjian.com/Artists/R/Tucker-Rule), he uses a 24" Zildjian K Light Ride. "Zildjian is king. All the greats for all the years, most musical cymbals ever." In this photo, posted by [Zildjian](https://www.facebook.com) on facebook, Josh's cymbals for Marmozets' Spring 2015 US tour are shown and listed, including his 24" K Light Ride. You can find this cymbal on Tarjeis [artist page](https://zildjian.com/artists/tarjei-str%C3%B6m-0) from Zildjian. unfortunately mine has a crack in it, this ride sounds really nice when opened up.